Alas! Battleworld hath cometh to the realm of James the King! For whatwith would a veritable conquest be without its tendrils reaching deep into the fledgling yesteryears the late Renaissance! Hereupon King James hunteth witchbreed, and in doing so, hireth Angela, the greatest of witchbreed hunters, and Serah, her lady associate, from the Abbey of the Queen of Heven! Forthwith shall hilarity ensue, as Angela and Serah fathom out a mystery of preternatural proportions, frequent the Mermaids Tavern, confabulate with the likes of James Barnes of clan Buchanan, Master Benjamin Urich, and one in the same as Christopher Kit Marlowe, acclaim’d poet and playwright of merry London! 1602 is one of my very favorite comic books. Period. Neil Gaiman, Andy Kubert, and Richard Isanove’s reimagining of the Marvel Universe as an Elizabethan period drama of intrigue, murder, and, ultimately, transdimensional science-fiction is at once an astounding creative feat as well as an absolutely stunning visual feast. For anyone who has not read it, read it; these alternate versions of Nick Fury, Dr. Strange, Daredevil, Doom, the Fantastic Four, the X-Men—they are nearly (if not more) riveting than their mainstream counterparts. Since the original series’ publication in 2003, Marvel has revisited the 1602 universe for a couple of minis here and there, expanding the roster to include and/or expand on characters like Spider-Man, Iron Man, Namor, Black Widow, Hulk, and many more. When Marvel announced the “merging of alternate realities” premise for Secret Wars, I was thrilled to hear that 1602 would be one of the featured battlegrounds. The world of 1602 is fairly simple to represent: we’re in turn-of-the-17th-century London, amidst the height of cultural revolution known as the Renaissance, and our stories are driven by the conflicts and intrigue one would typically associate with a Shakespearean play (and the language tends to match Shakespeare’s Early Modern English as well). One of the core conflicts is the burgeoning population of Witchbreed, the 1602 counterpart for mutants. In 1602: Witch Hunter Angela, Marguerite Bennett and Kieron Gillen return to this world of Witchbreed and King James and faux-Shakespearean heightened language and taverns and poets. Here, Angela and Serah hunt Witchbreed (hence the title) as well as a new form of evil known as the Faustians. According to Angela, Witchbreed have no choice and are born as abomination; Faustians choose to be evil, and thus warrant swift, immediate discovery and action. The problem, of course, is that they cannot be found. Much of the first issue is dedicated to immersing readers in this strange, distant-in-both-time-and-place world. There is a distinct tone and tenor to this book that will take a bit of getting used to; speaking as an English teacher, it’s sort of the same learning-curve that my students go through when we first pick up Macbeth or King Lear—there is a brief moment when the reader initially rejects the strange language and manner of speaking, the eccentricities of the characterization and setting, but very soon after, he is immersed in a world of rich, visceral imagery, sensory detail, psychology, and musicality. Of course, whereas Gillen and Bennett nail the language and the characterization (Angela is just so damn cool and bad@$$), it’s really up to artists Stephanie Hans and Marguerite Sauvage to capture the visual sense of 17th Century London. Needless to say, this book is gorgeous. Sauvage handles the brief introductory sequence in which Angela and Serah shockingly assassinate a particular character in brutal fashion (played as a romp, of course), and her fine linework and pseudo-pop-tableau aesthetic is perfectly befitting the tone and era of the piece. The true star here, however, simply in terms of page-count and execution, is Stephanie Hans. Hans, more frequently known as a cover artist, expands her storytelling sensibilities here, imbuing Bennett’s script with a sense of otherworldly, “have we eaten of the insane root?” acid trippy hyper realism. Whereas the original 1602 saw Kubert and Isanove play with a sort of quasi-engraving scratchboard-esque style to mirror the timeperiod, Hans completely lets lose here to capture a supernatural strangeness reflected in the extraordinary characters and conflict of the narrative. It’s just stunning. Take thine purse and purchase this tale! 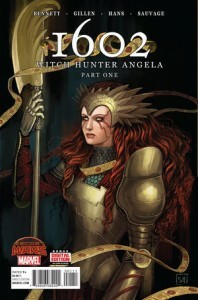 1602: Witch Hunter Angela twill be unlike any else you shall read in this grand Secret Wars conundrum! Masters Bennett, Gillen, Hans, and Sauvage ought lauded be for this thine own story of Witch Hunters and Kings, Intrigue and Drinks, Demons and Dabblers! Checketh it! Comics and Coffee: The New Batman, Nimona and Stuff!